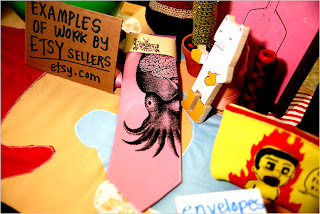 With the caption: Cephalopods are an up and coming motif. The article notes: "So while the sparrow and the owl — last year’s favored animal and the symbol of the fair — are out, the octopus, a burgeoning contender for creature of the moment, has been joined by other sea dwellers, like the squid." Ahem. I'm not an I told you so sort of person, but Come. On. I do believe we called this a week ago.